I love ski towns, and recently I discovered that Breckenridge, Colorado is one of the best ski towns there is. Their little main street is chock full of shops and different dining experiences. Since this was my first time in “Breck,” I wanted to cover my bases, dining-wise, by visiting a couple of hometown staples, at least one carry-out option and the newest, most buzzed-about restaurant. From our concierge at Marriott’s Mountain Valley Lodge, I learned that Breckenridge Distillery had opened a tapas-style restaurant in December 2016. That’s all I needed to hear. When an opportunity for a unique dining experience knocks, I always open the door — and when it includes handmade spirits, I run to that door. 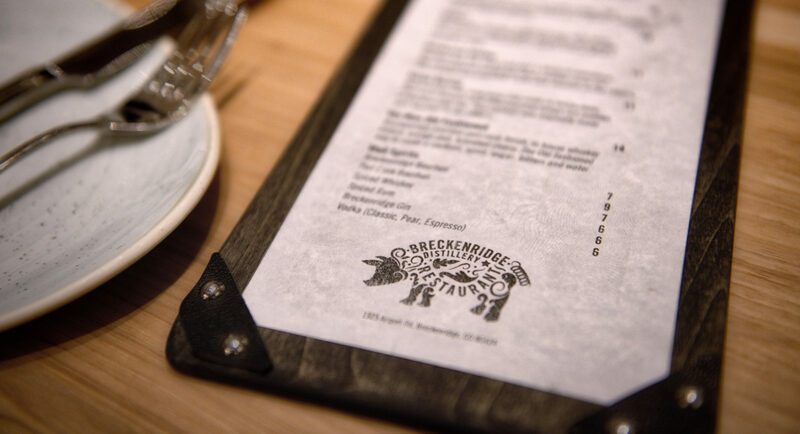 Breckenridge Distillery Restaurant focuses on seasonal, locally sourced food and small plates, as well as the previously mentioned small batch handmade spirits. Located in the same building as the distillery, the restaurant is about a 15-minute drive from Marriott’s Mountain Valley Lodge. Reservations are a must. After talking to the concierge, my expectations nearly matched the altitude of Breckenridge — but they were exceeded in every way. The restaurant’s contemporary gastro-pub design creates a wonderful atmosphere, and the staff is attentive from the moment you hang your coat. 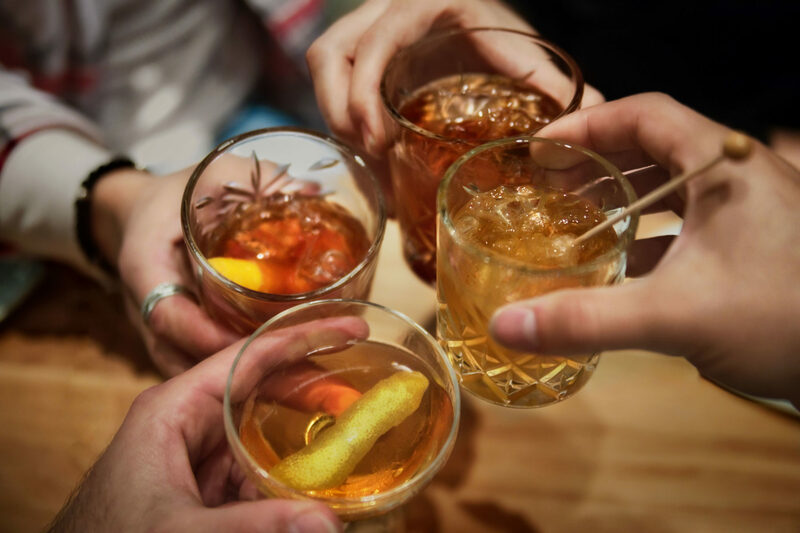 Sip on a craft cocktail. First, we reviewed a menu of handmade craft cocktails created specifically for the launch of the restaurant. I’m always a sucker for a well-made Old Fashioned, but when you name it the Obi Wan there’s no chance I’ll drink anything else. My group of five all ordered different cocktails, but most of them switched to the Obi Wan with me for round two. Try tapas, tapas and more tapas. Next up was the diverse menu. Most of it made my mouth water, so we decided to do a sampling based on our server’s recommendations. We started with a small plate of deviled eggs. I’ve never been a fan, but after watching my companions eat all but one, I decided to try a bite. That bite was so good that I ordered another small plate. The eggs were served very cold, and they had an amazing texture. Topped with finely chopped green onions and a pinch of sea salt, they were the best deviled eggs I’d ever had. 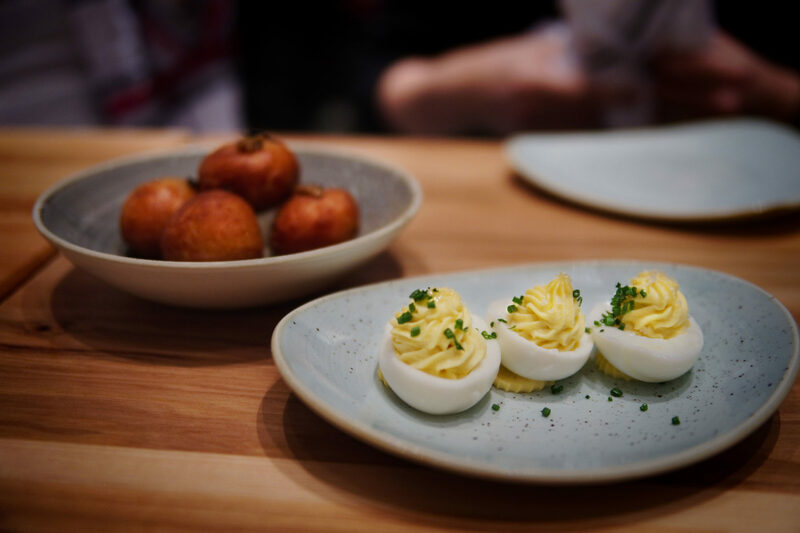 At that point, I thought: If this chef could make a deviled egg that made me order seconds, what else could he do? Next, I ordered the chicken liver profiteroles. 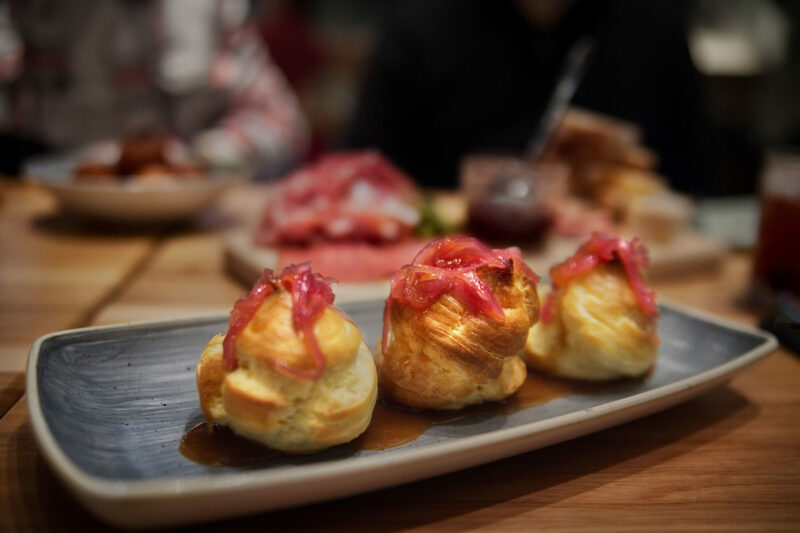 Profiteroles are traditionally crème puffs; these used the same type of crispy pastry, but with chicken liver baked into the middle and onion marmalade over the top. The flavor combination was fantastic. I also ordered the truffle fritters with mushroom dust, served over a generous dollop of fondue. As expected, these were quite rich, but delectable and light in texture. Such a small plate allowed for a tasting of decadence without all of the guilt. After that, the plates arrived at our table closer together. Before I knew it, tapas covered the entire table. Everyone loved the braised Brussels sprouts, which were pan seared with hazelnuts and maple syrup. The unconventional take on calamari was also a hit. When it arrived at our table steamed in a light tomato ragu, we were pleasantly surprised — and used every piece of spare bread to soak up the sauce. 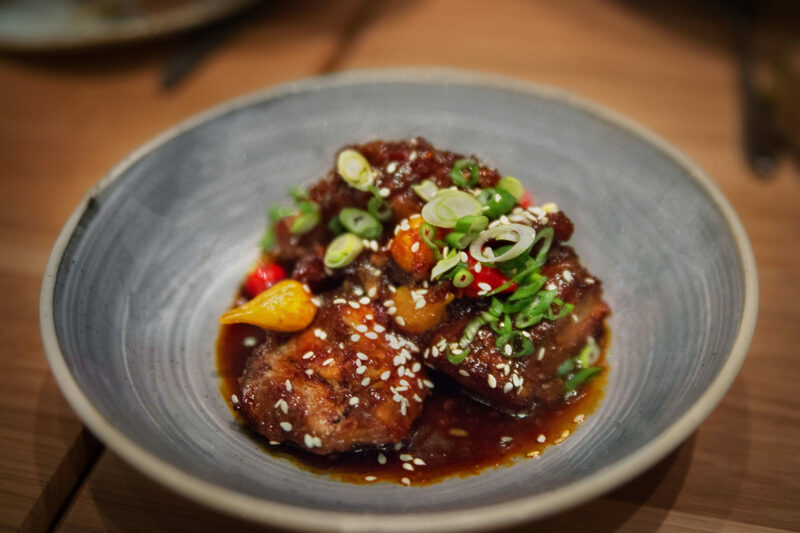 From the meats section of the menu, we chose the pig brisket served in small chunks with bulgogi, peppers and scallions. The pickled, spicy, tiny peppers combined with the sweet tang of brisket sauce to create the perfect combination. The charcuterie board did not disappoint, either. 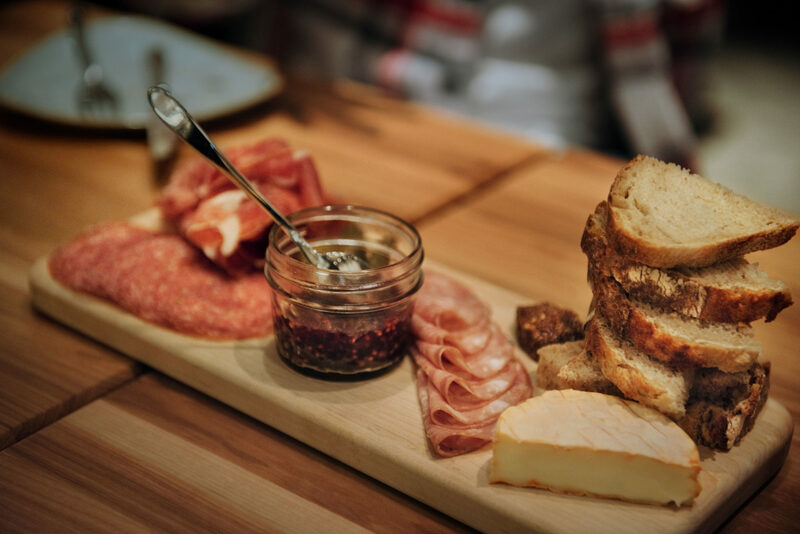 The plate included razor-sliced jamón, salami, mortadella, a cow’s milk cheese, a stack of thinly sliced, house-made sourdough, a dollop of the chef’s special grain mustard and raspberry bourbon marmalade. The spiciness of the mortadella combined with the creamy cheese and the sweet marmalade was just as amazing as the peppered salami and milky cheese paired with the tangy mustard. The menu also contained a family-style section, including full roasted farm-raised chicken and succulent pan-seared organic duck breasts. 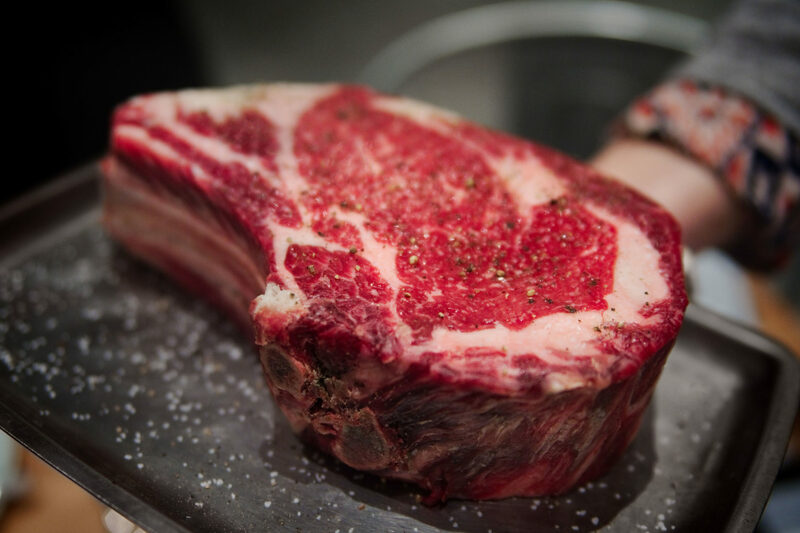 The night we visited, they also offered a special chef’s-cut ribeye. The server brought the uncooked 4″ cut to the table so we could approve it before we ordered. Eventually, the steak arrived accompanied by pan-roasted mushrooms and a French mashed potato dish. The creamy and buttery potatoes partnered wonderfully with the salty, tender flavor of the ribeye. As a final treat, our server suggested we try one of the evening’s house specials: chicken poutine. New to me, poutine is a Canadian dish traditionally featuring fries, cheese curds and gravy. Our chef’s twist added chicken to the cheese curd and subbed crispy Hasselback potatoes stuffed with gruyere and crispy jamón for the fries. Ladies and gentlemen, this is why you always take a recommendation from your server. I would never have ordered the poutine on my own, but it was delicious and disappeared in less than 5 minutes. Discover what dining out is all about. At the end of the evening, my cheeks were starting to hurt from smiling so much. Each plate that arrived at our table had delivered on the promise of a unique and spectacular culinary experience. This is why we ventured out on a snowy, freezing night, and this is the only reason I ever go out to eat. I want to be wowed, and I want to try something new. 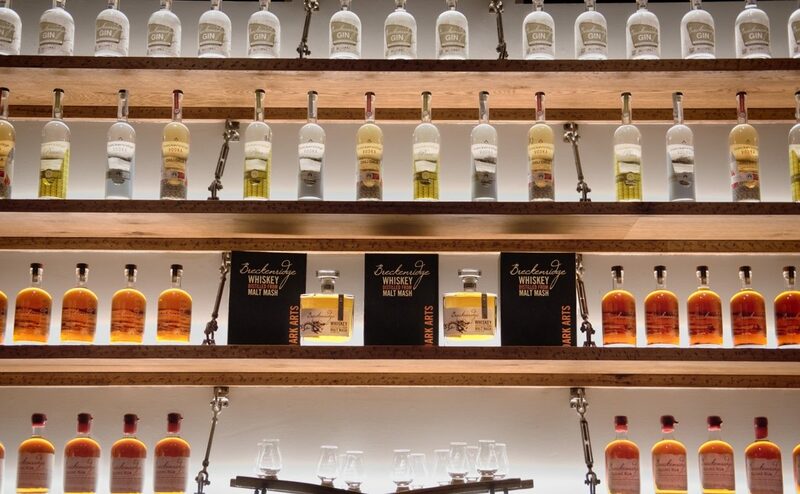 It’s always a win to find a restaurant that accomplishes the trifecta of impressing me, surprising me and educating me — and Breckenridge Distillery Restaurant did just that.